Jessie Wozniak, a Microbiology and Molecular Genetics graduate student at Emory University School of Medicine, presenting at the ASM Microbe conference held in Atlanta, GA. Researchers from the Emory Antibiotic Resistance Center described the first strain of carbapenem-resistant, hypermucoviscous Klebsiella pneumoniae exhibiting colistin heteroresistance and enhanced virulence isolated from a patient in the United States. 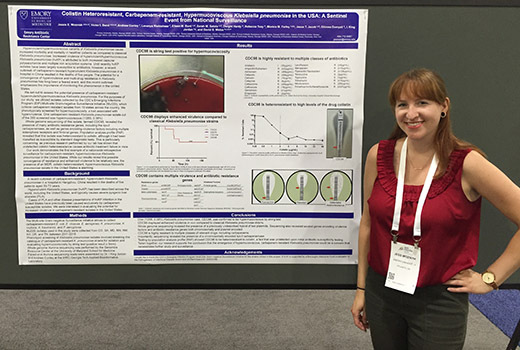 The research was presented on Saturday, June 9 at ASM Microbe, the annual meeting of the American Society for Microbiology, at the Georgia World Congress Center in Atlanta. “The problem of antibiotic resistance is becoming increasingly alarming. The combination of increased virulence and multidrug resistance makes the situation worse,” says David Weiss, PhD, director of the Emory Antibiotic Resistance Center and associate professor of medicine (infectious diseases) at Emory University School of Medicine. The researchers showed that the K. pneumoniae isolate was heteroresistant to the last resort antibiotic colistin. This means that a small subpopulation of cells showed resistance. Heteroresistance is more difficult to detect with standard antibiotic susceptibility tests in clinical microbiology labs, and this isolate was classified as susceptible to colistin by standard methods. This discrepancy is particularly important, as Weiss’ lab has shown that such undetected colistin heteroresistance can cause antibiotic treatment failure in mice. Previously reported hypervirulent forms were largely antibiotic susceptible. Carbapenem-resistant K. pneumoniae, part of the carbapenem-resistant enterobacteriaceae (CRE) superbug family, is considered an urgent (top 3) threat by the CDC. The Weiss lab is part of the Emory Vaccine Center and based at Yerkes National Primate Research Center. The bacteria in this study were identified through a Centers for Disease Control and Prevention (CDC)-supported surveillance program.